Happy Friday from Jupiter, y’all! I’m so sorry for missing my Wednesday post. It seems like summer really is over (despite the heat and rain) and I’ve been transported back to reality where having an hour or two each day to blog is impossible. I’ve been cooking from scratch (with both successes and failures), personal training at the gym twice a week, and attempting to keep my house somewhat clean, all while working 9 to 5. On top of that, much to my delight, I am re-reading the entire Harry Potter series to P, which takes up most of my evenings. We just finished The Chamber of Secrets last night. I’m terribly worried about what’s going to happen when P and I have little JUP Babies… How am I going to fit it all in??? Enough about the monotony of life – let’s move on to something fun: Food Truck Invasion! A week ago, P and I ventured with our friends Rich and Jessica to Downtown Abacoa for what’s become one of the biggest draws to the shopping center – a gathering of gourmet meals on wheels. On the second Friday of each month, food trucks serving every cuisine imaginable line Abacoa’s Town Center Drive: tacos, lobster/lobstah rolls (depends on where you’re from, ha), hamburgers, BBQ, soul food, fried anything. You name it, they sell it. Food trucks have shed their “roach coach” image for a hip way to get your grub to go. Couple that with a new family-run microbrewery in the plaza and you have the perfect South Florida autumn-ish evening: munchies, beer, and friends. Even a passing rain shower didn’t keep the crowds away! 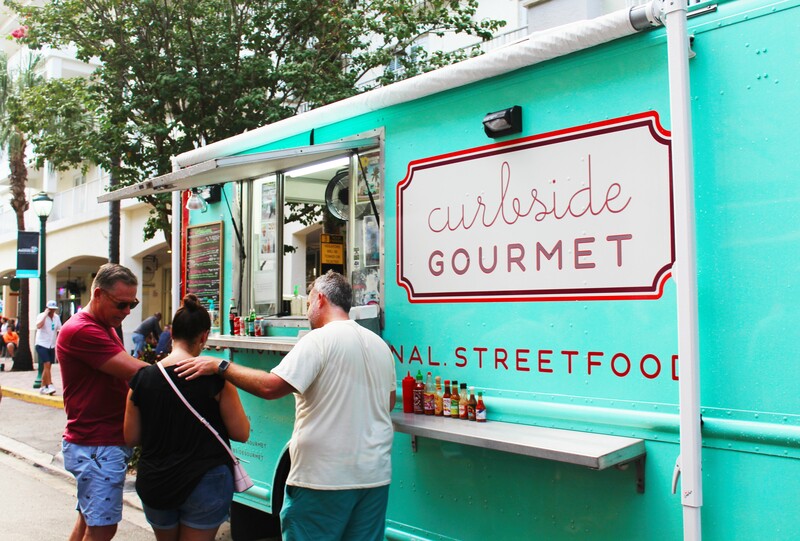 After sizing up our multitude of options, P and I couldn’t pass up our favorite truck, Curbside Gourmet, based out of West Palm Beach. Besides being painted a cheery mint green, they have a diverse menu that is sure to please everyone whether you are craving seafood, a giant burger, or tacos. P and I seriously considered catering them for our wedding before we selected our venue, Out of the Blue. I opted for the chicken and waffles, served sandwich style with a generous drizzle of maple syrup. P decided on the “Surf & Turfed” Eggs Benedict, which Curbside Gourmet entered into Thomas’ English Muffins Breakfast Battle, a competition between 50 food trucks across the nation to see who can create the most fantastic recipe using Thomas’ English Muffins or Bagels. Crafted with pork belly, citrus, and ginger and smothered in a lobster hollandaise sauce, it’s an explosion of flavor in your mouth. The “Surf & Turfed” Eggs Benedict. P gives it two thumbs up! You can vote for Curbside Gourmet’s English Muffin creation here. Vote once every day – the first round ends on September 18th with the elimination of 25 trucks. Make sure Curbside makes the cut! Sweating and enjoying my chicken and waffles. Jessica and Rich are the inversion of me and P – Jessica and P LOVE seafood while Rich and I prefer chicken. Yes, I will order chicken tenders at a crab shack. So, Jessica chowed down on a lobster roll while Rich and I enjoyed our twin chicken and waffle sandwiches. Don’t miss next month’s Abacoa Food Truck Invasion on October 7th from 5:30 p.m. – 10:00 p.m. 1200 Town Center Drive, Jupiter. Looking for a mid-week food truck pick-me-up? Head to the Seabreeze Amphitheatre at Carlin Park on the second and fourth Wednesdays of the month from 5 p.m. – 9 p.m. for Family Nights with Food Truck Invasion. Enjoy a picnic by the beach! 750 South State Road A1A, Jupiter.